I must say, I’ve been wanting a Kaweco Sport for a while now, but I specifically wanted a BB nib. And the specific combo I wanted wasn’t available so I waited. Now in general anything from a M up just doesn’t do it for me with regards to everyday writing, so why the very abnormal obsession with BB? 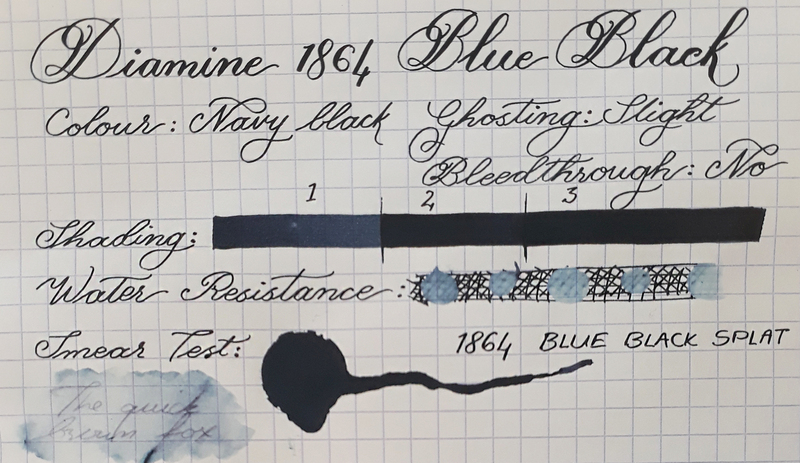 Well, my favorite ink of all time is J Herbin Stormy Grey. 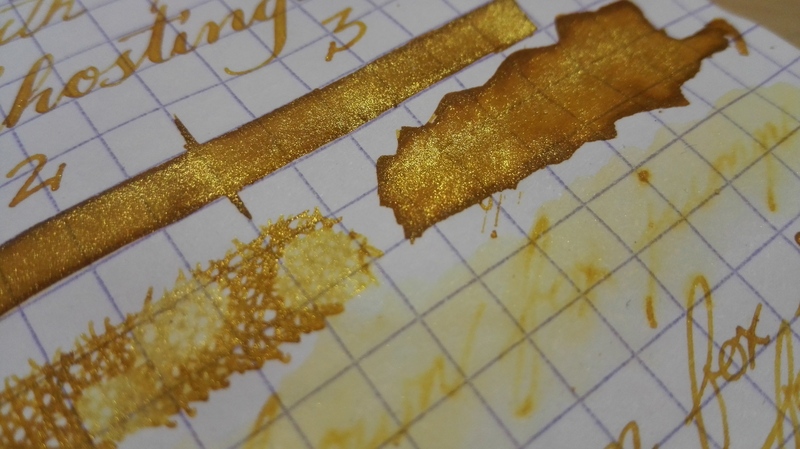 And yes, it works perfectly fine in a M or B but I really like creating page patterns with this ink. 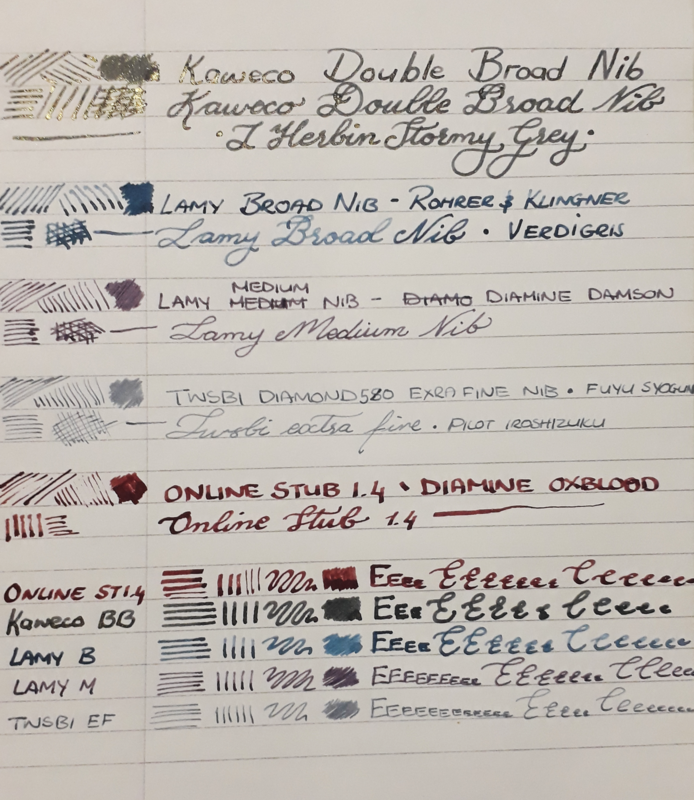 A BB nib will fill it out the coloured areas quickly, and is the only standard sold nib size missing from my current collection. Also I had this idea in my head of the perfect ink, pen, nib and pocket journal combo. So I present to you the most perfectly matchy travel combo of all time: The white and gold Kaweco Sport, with a BB nib, filled with JHerbin Stormy Grey used with the TWSBI A6 pocket journal. But back to the pen. 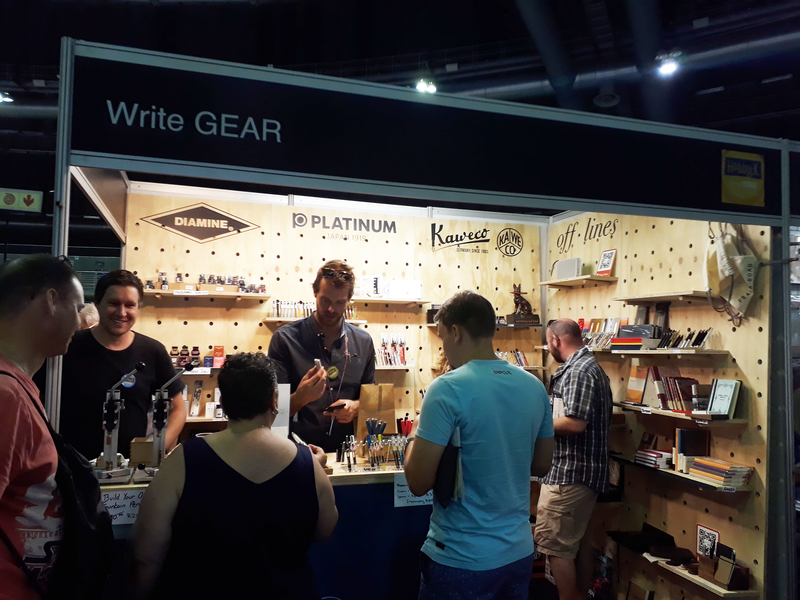 I got my pen at Hobby-X expo in Joburg, my main reason for going was that Write Gear decided to do a pop up stand. This was my chance to drool over all the perddddy, and finally get my hands on that elusive BB nib. Now I must apologize, the pen packaging got into an altercation with an apparently “empty” cup of coffee… unfortunately the coffee won. 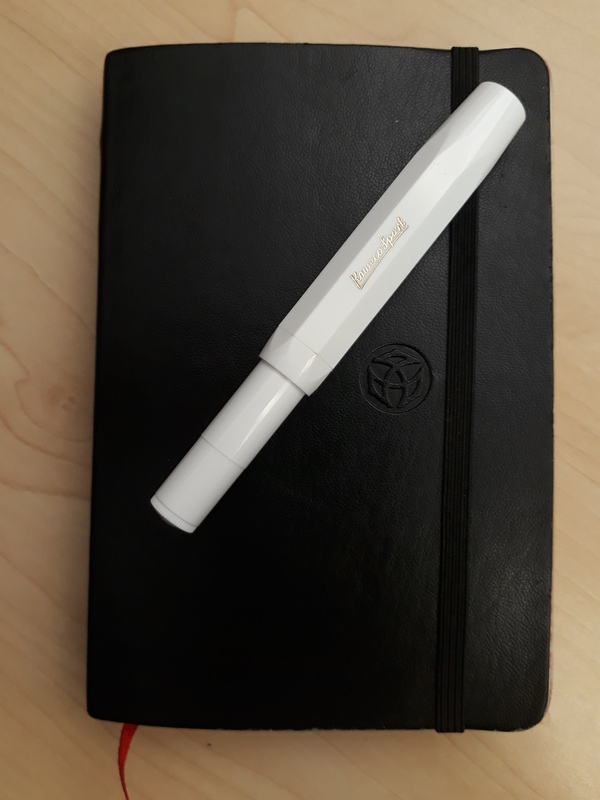 So I don’t have a photo available, but the pen comes in a basic black slimline box with white Kaweco prints all over it. The pen is simply wrapped in a protective plastic wrap that has a sticker with a barcode. The pen itself comes assembled with a single blue cartridge inside. Now my initial plan was to turn this pen into a drop filler, but once I got home I realized my O rings were to big for the actual pen. I just went ahead, used some silicone grease and filled it anyway, but getting a mini converter just seems safer. The design of the pen is modern an classic at the same time, while the octagonal cap provides an anti-roll function which I find very useful. The pen is travel friendly when closed, but posts to a comfortable almost full sized pen. This nib does give me a few hard starts and skips, but as a disclaimer, I did purchase the only BB nib that was available and it happened to be a demo nib at the show. 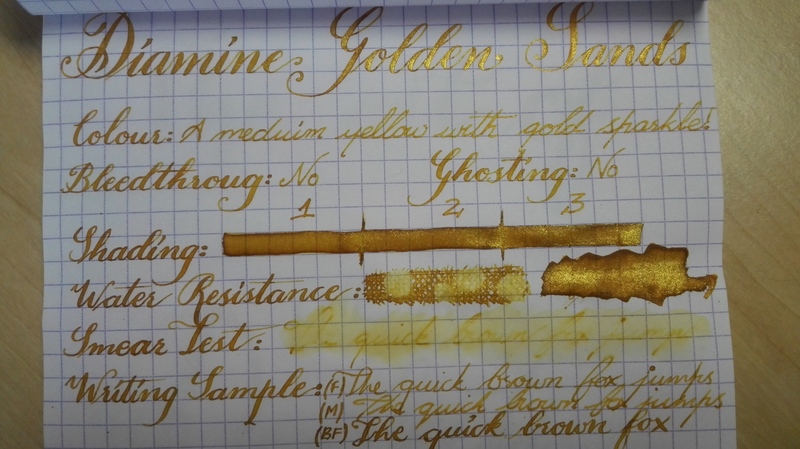 Also the fact that i’m using a shimmer ink probably doesn’t help. Other then that it writes like butter, its amazing. The other thing I regret not getting is the clip attachment. I honestly thought it would be more in the way then anything else, but walking around, it would be much more convenient if I just clipped it onto my notebook. 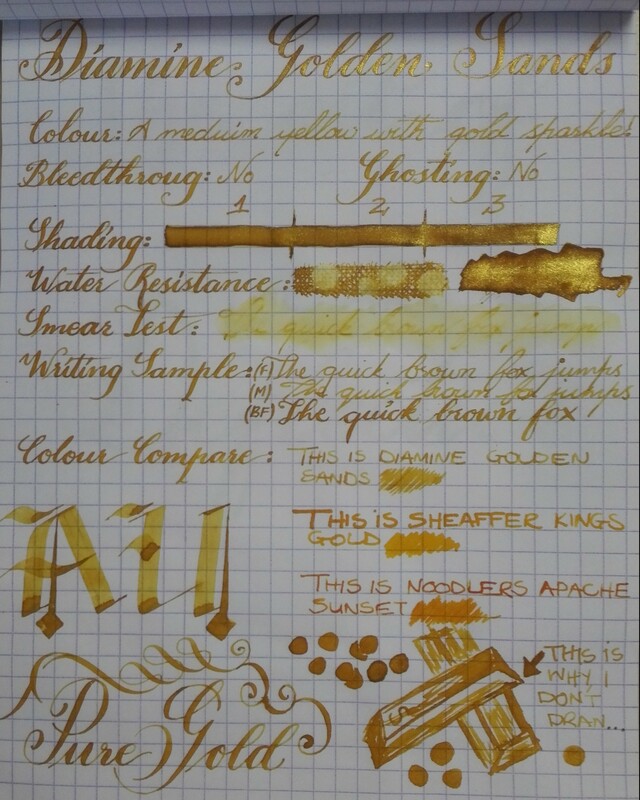 All in all I’m very happy with this pen, and it will be my official shimmer ink pen going forward. My TWSBI Diamond 580 is still my favorite everyday pen by far, but as an affordable travel pen – this is highly recommended. to see all the stock was defiantly the highlight of the expo. Wow, just wow…over a year since my last post – that’s a record. Shout-out to the reader who reminded me I actually have inks that need reviewing! Hopefully the annual break won’t be repeated. Does anyone even read blog post anymore? With youTube so readily available, and Instagram being a mini film mecca, the moving pictures of Hogwarts seem to have become a reality. Nonetheless, ponderings for a different day > to the ink! Diamine 1864 Blue Black was part of an anniversary collection released to celebrate Diamines 150th year, the bottle is one of 8 wedge shapes that come together forming a perfect circle. 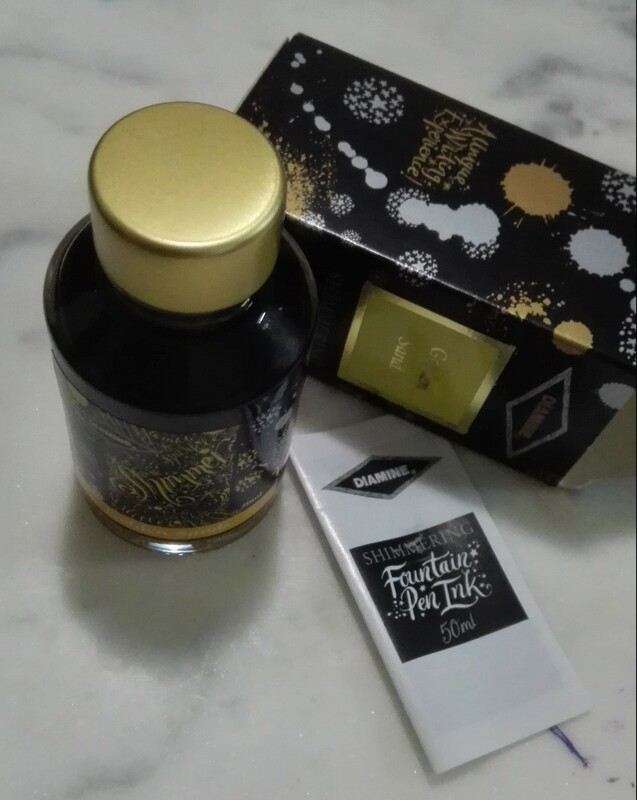 I did not purchase the bottle, as my love of blue and black inks tends to be very limited. But it defiantly is the most blue-black, blue black ink I have tried. The colour reminds me of something James Bond would use to sign a document. Formal enough to be accepted on any legal document, but on closer inspection, not all is as it seems. Although that may not be the best idea, because any water would make the inked document null and void. 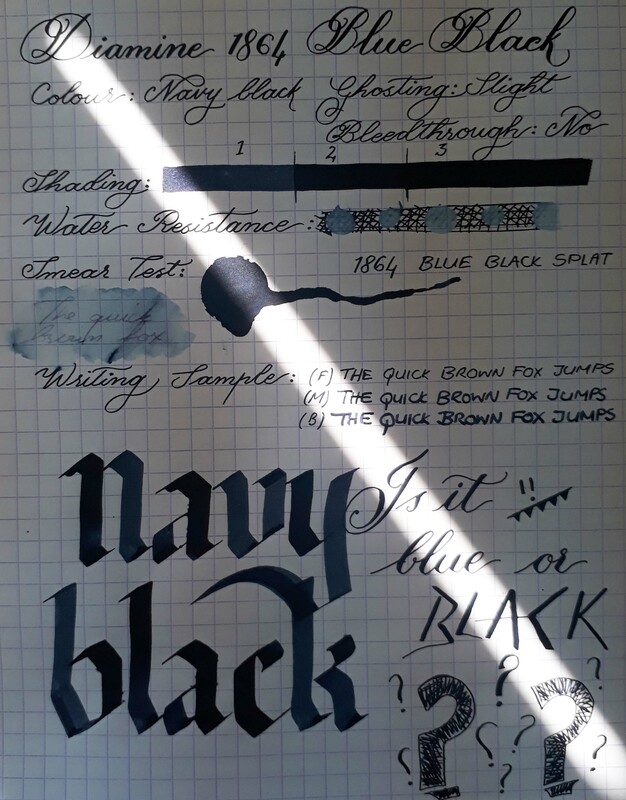 I would describe the colour as Navy Black, and uniquely enough, the wetter/broader the pen – the more navy the colour appears. This ink did not feather or bleed through in normal writing, but when using the Pilot parallel I did notice feathering. As this is fairly rare on Rhodia Paper, i’m guessing this may not be an ink that fares well on standard pad and copier paper. 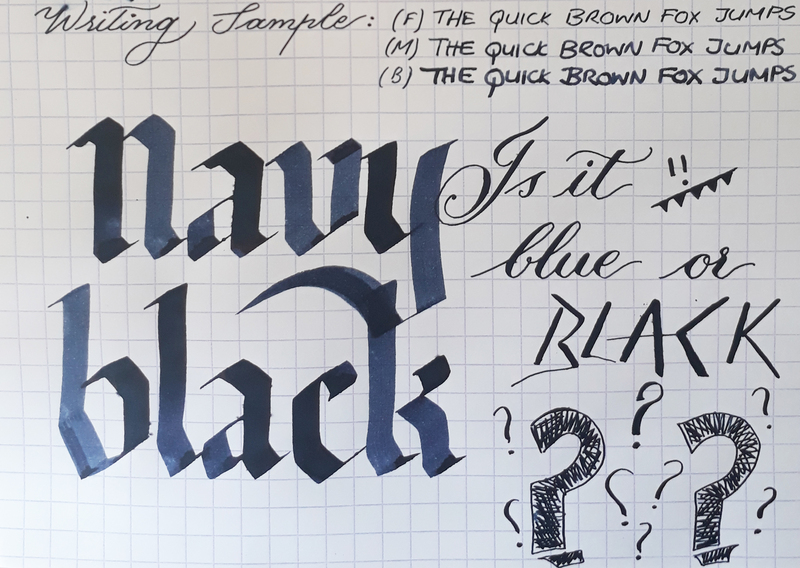 Below are a few ink drop comparisons, and I stand by my statement – a lot of blue-black inks that I try immediately get classified as navy blue in my head, this one really does have me asking the question… Is it blue or black? I’ve had this colour in my pens for the whole month of October cause you know Halloween and pumpkins, it was a no brainer. Although I don’t care much for Halloween, and have no interest in pumpkin pie – it was a nice colour theme for the whole month. This colour is beautiful – super vibrant and summery. Has good smooth flow, water resistance is non-existent – as is expected, and the shading is minimal. 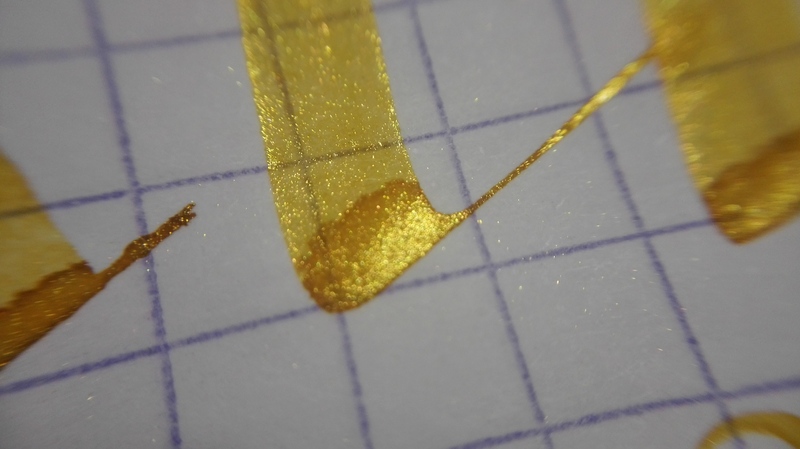 This ink doesn’t have a really visible sheen to it, more like a definite shading line. I know this ink is called pumpkin, but this colour makes me think of summer days, juicy oranges and melting snow cones. Oh and Orange is the new Black – that series name is so catchy is ridiculous! Every time I hear the word Orange my mind automatically adds “is the new black”. The closest colour comparisons I had in my collection were: Diamine Peach Haze, Noodlers Dragons Napalm, Diamine Autumn Oak and Lamy Red. As you can see below none of them are a perfect dupes. This ink was bit more work to clean out, but that could simply be because it was in my pen for such a long period of time. There was also some bleed through, but none in normal writing, and only when going over the same spot multiple times – and even then it as minimal. 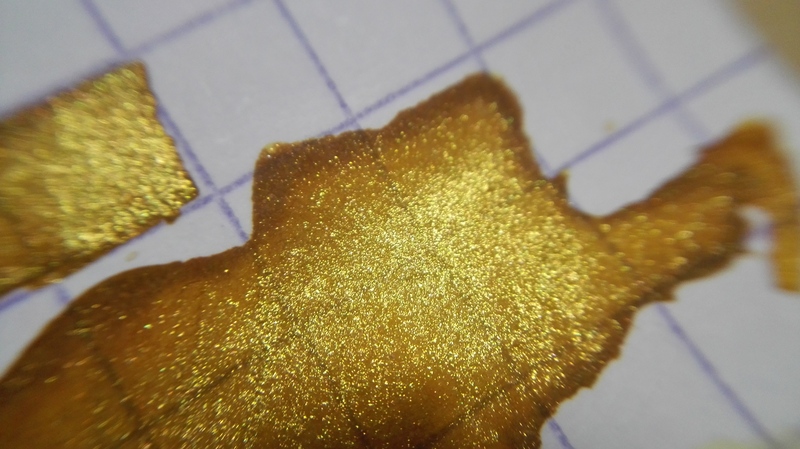 I also took a few macro shots so below you can see a close up of the ink splat, and the transition in shading. I enjoy small notebooks mainly due to the fact that i’m not really the journal type – strange I know considering I have a blog, but I digress. So the whole lined with enough space to write an entry has never effected me. That being said I do love doodling, and the smaller size allows me to complete a design in a relatively small amount of time. It may seem expensive for an A6 notepad, but you get a lot of pages… I’ve used a few notebooks and so far the TWSBI has been my favorite for a few reasons. 1) It has a leatherette type cover, and for me, a person who is incredibly accident prone I spill things. Thanks to the fact that this cover isn’t card stock, I can just wipe it clean an move on. 2) It has a back pocket very similar to Moleskine but much sturdier and more expandable then their cashier notebooks. Not sure about their other ones, never used them. 3) It has a lot of pages, 240 i think – and every single one of those pages is perforated, this is the most amazing thing about this notebook. Hate something – no problem, just tear it out, without effecting the binding. 4) The paper quality is good, really good. I would say that its perhaps better then the standard Rhodia graph pad – but as you’ll see in the pictures, I really put the ink down and it handles it with minimal bleed-through if any. I’ve also used watercolours, gel pens, nail polish, water brush pen, etc… and it handles them just fine. 5) Comes with an elastic and a bookmark, I find the elastic useful as it keeps the notebook closed – bookmarks are debatable. 6) The paper also has a very smooth feel, but the paper is also quite thin and therefore translucent. So if you like using both sides of the same page, this may not be the best choice for you. Below are a few pictures that demonstrate how I use the paper. I’ve included both the front of the page, as well as the back. Below is using the TWSBI 580 filled with Diamine Carnation, easily one of my favorite inks. Here is one using nail polish, gelly roll and watercolour. Mixed Media – nail polish, watercolour and jelly roll. This one was a complete ink overload, I spilt some J.Herbin Emeralds Of Chivor… so instead of wiping it up, I decided to paint the whole page with it using a paintbrush. Once that was almost dry I then went back in with a diluted solution to get the dripping effect. And once that dried I copied a mermaid in using a Sakura Micron Marker. My first attempt at watercolour urban sketching. Done using only Diamine Chocolate Brown. The main doodle was done with a Lamy Safari(M) and then faded out using a water brush pen. Lastly I figured I should include a page that contains actual words, written with a fountain pen…after all, that’s what this book is marketed for. So I decided to write out a lyric from Of Monsters and Men with Noodlers X-Feather. Of Monsters And Men lyric in Noodlers X-Feather. And a poem by Thomas L Peacock called “Beyond The Sea”. The ink used in the poem was Diamine Majestic Blue, and the watermark background was done using Diamine Beau Blue. Poem by Thomas L Peacock – using Diamine Majestic Blue and Diamine Beau Blue. 1) If you plan on wetting the entire page excessively you need to put a paper towel beneath the page. All the pages are perforated and the liquid will seep through the perforation. 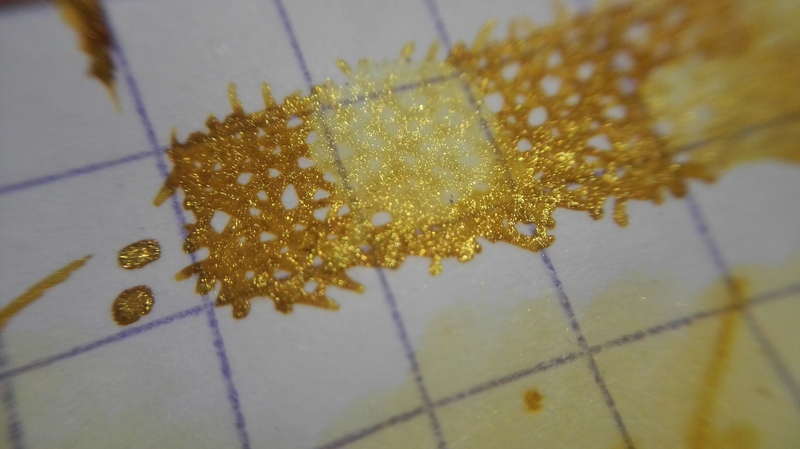 Additionally if you wet right over edges, the colour will start to seep under the edge of the paper. 2) Leaving a large amount of water on the page will cause it to start going through the paper. ie: damp paper is perfectly acceptable but leaving wet pools will cause it to bleed. 3) Please don’t do what I did and push a large amount of liquid ink/paint right up into the binding, it’s liquid – it is going to get into the crevices of the binding. Brusho background with some traced crystals. 4) This is NOT watercolour paper, so it will bend and buckle when wet. To its credit though it does flatten out. But could have been worse though right? This pen is so unique! I must say the for the last three years the Special Edition Safari’s have been on fire!! Loved the neons they did, and now they’ve completely switched it up with a matte, black trimmed, vampy purple. I’m never sure if i’m going to buy the Special Edition every year, there are a few reasons for this. Firstly the design is always the same, the colour simply changes. Secondly the colours that were released before the neons, to me, weren’t all that unique. And before the these pens where available on Write Gear, the only nib size available was a medium – which meant the writing experience would be identical. So I was never quite convinced of its “Specialness”, but seriously – the last three years have been on point. At least in my opinion. This pen must be one of the most talked about Safari’s Lamy has every released. It’s purple, which to my knowledge has never been done but has constantly been asked for… So i’m pretty sure most people would have been very happy with a purple in the standard glossy finish and stainless steel trim. And if that had been the case, the chances of me buying it would have immediately halved. Thankfully Lamy had different ideas, and the results are incredible. The pen comes in the standard faded black cardboard box, with the Lamy logo neatly printed dead centre in silver, and the multiple cut-outs providing a sneak peak of the pen. It also has the standard cardboard insert which the pen clips onto but that’s about it for the packaging. Bold, functional and minimalistic. The finish on this pen is matte, and as a result of that it has a very fine textured feel to it. This actually means that the pen is even more comfortable then the glossy Safari’s. It comes with a standard blue cartridge, and the traditional cardboard ring to prevent the cartridge from accidentally piercing. I bough mine from Write Gear, so I also received a dark lilac cartridge and was able to choose my nib size(seriously one of the best features ever). I finally decided to give the bold nib a try, and as you can see the black trim goes perfectly with the purple of this pen, giving it a slightly stealthy vibe. You can also purchase a Lamy Z24 converter for the Safari so you aren’t limited to the proprietary cartridges Lamy sells. 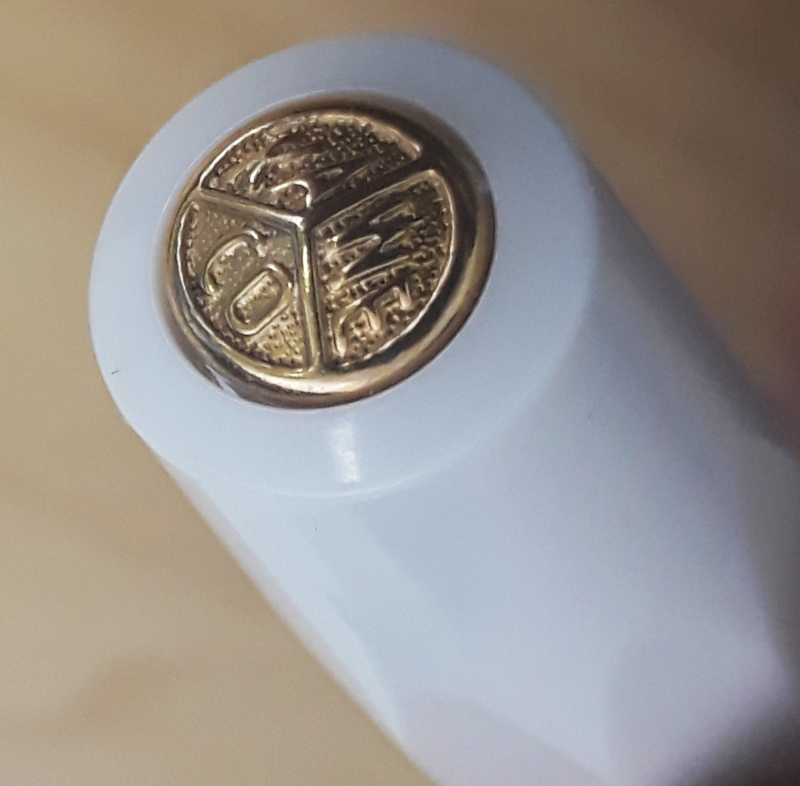 This converter has a plastic dots on the sides, that fit perfectly into the notches on the pen. Which is really cool, as it acts as an additional measure to keep your converter snugly in place. Some days I feel like matching the ink to my pen, but today was not one of those days. 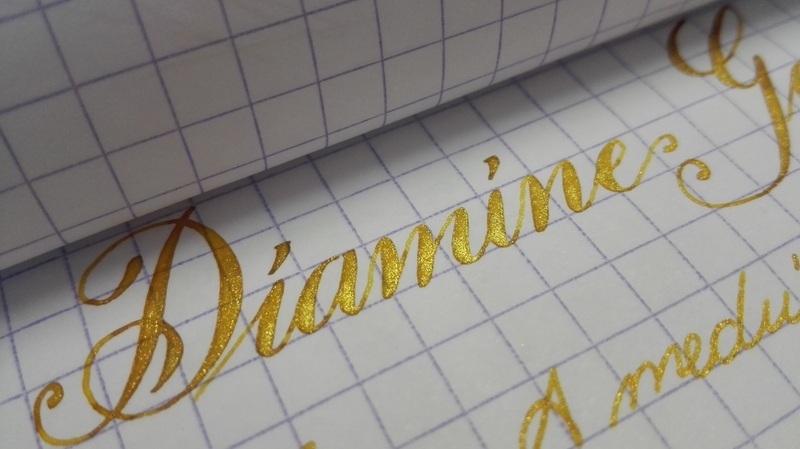 Instead inked it up with Diamine Soft Mint, and no surprise it wrote smoothly right off the bat. And then I just started taking a lot of photo’s….. This is another one of those inks that I personally find addictive. I ink up a pen, and end up constantly using it,until i can convince myself to stop re-inking in the same colour and start rotating inks again. The name Smaragdgrün means emerald and as you can see in the images it’s a pretty accurate description of the colour. Colombian emeralds to be even more specific, and somehow they’ve also managed to add some of the same glowy depth. Then again I really love this colour so take this review with a pinch or two of salt. You’ll also see that I spelt Smaragdgrün wrong:( I left out the d. What can I say – spelling has never been my strong suit. I’m pretty sure auto-correct was invented because of people like me. Like all Rohrer and Klingner inks, this one is beautifully behaved. No feathering, bleed-through, dries relatively quickly and the shading in my 6mm Pilot Parallel is just so prettttty, and the sheen – look at that red black sheen… K i’ll stop now. And I don’t know why this happens, but its the second ink I’ve tried where that the shading line looks very different to the shading in the calligraphy. Any ideas? Water resistance is non-existent but this also meant that cleanup was super easy. Decided to do some colour chromatography with this one – and was immediately reminded of a Nebula. Even though I positively enjoy using this colour, and I find the label and box pretty I am not fan of the bottle at all. 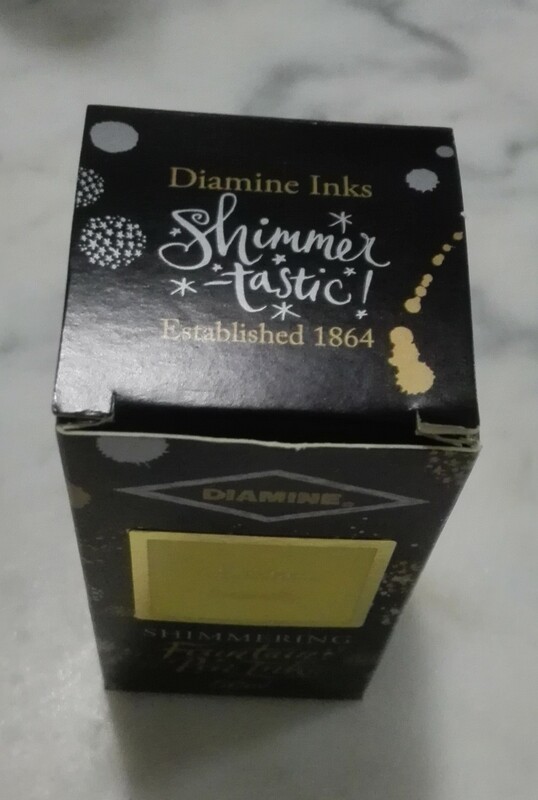 Its a 50ml bottle and in my personal opinion I find the normal Diamine 80ml bottles much more appealing, and at least the Diamine 150 Anniversary bottle is interesting. 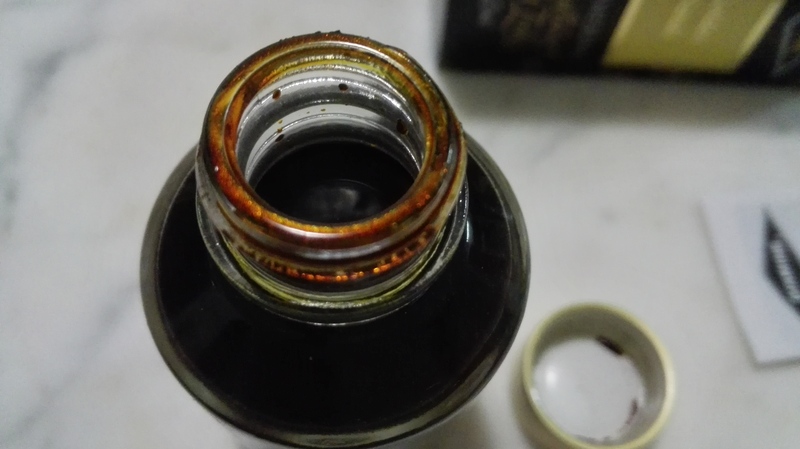 The only thing I like about the bottle is that the cap matches the shimmer colour in the ink. 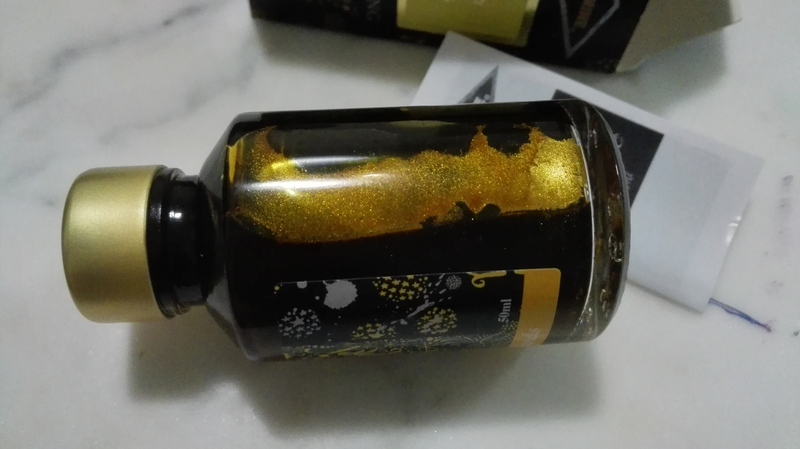 Then again, how important is the bottle, when the ink is pure gold right? When looking at the page straight on, the shimmer isn’t that pronounced – the colour is more of a medium to dark yellow with highlights. 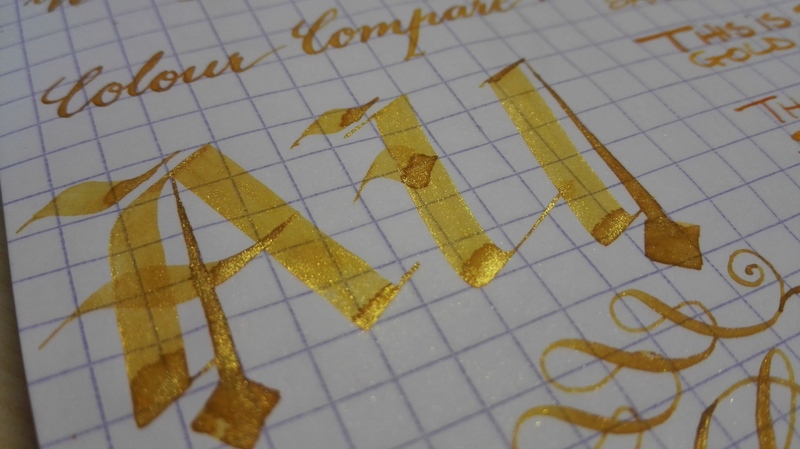 The minute you tilt the page it turns into over the top shimmery goodness. You always need to shake the bottle before filling. While writing you need to routinely rotate the pen, and turn it upside down a few times to prevent the shimmer from settling. Extra Fine and Fine nibs tend to give hard starts – stopped the flow completely in my EF nib. 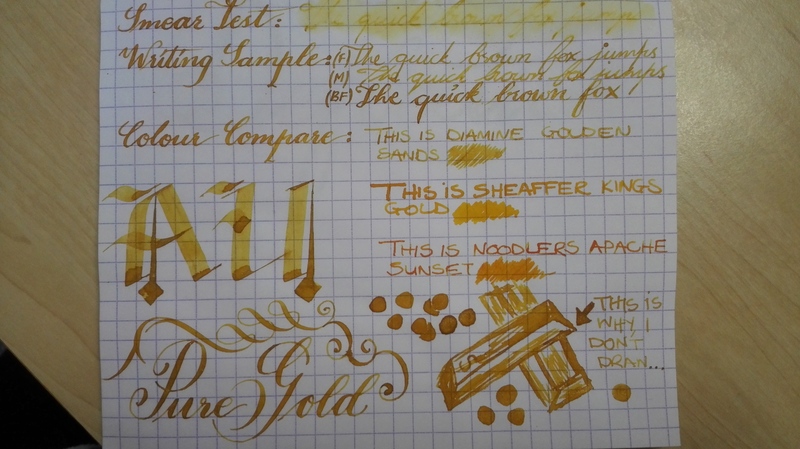 This type of ink is defiantly best used in M nibs and up. Clean up requires a bit more dedication then normal. 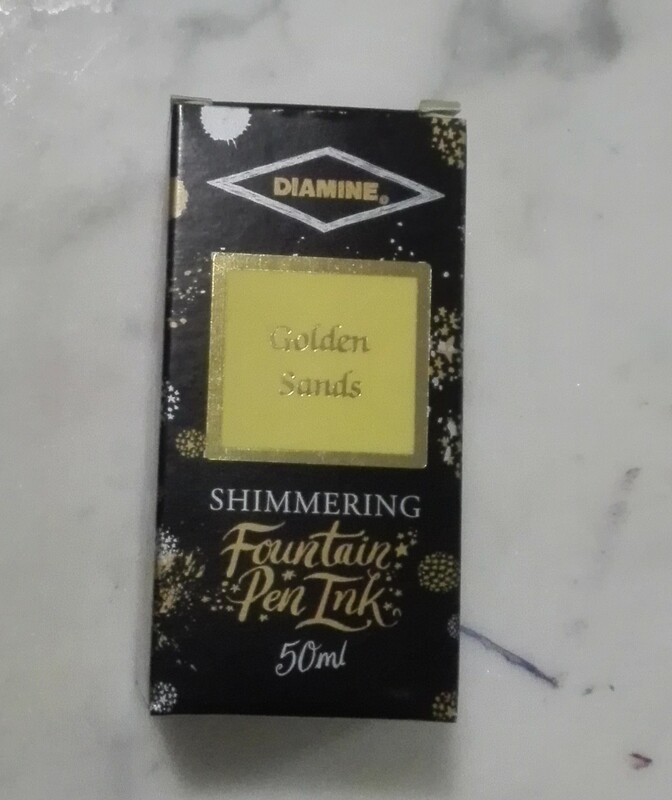 If you are hell bent on removing every single trace of shimmer then it requires commitment and a pen you can easily disassemble. For me, none of the above is a deal breaker – and personally I like the bit of shimmer residue that finds its way onto the page from a new ink fill. 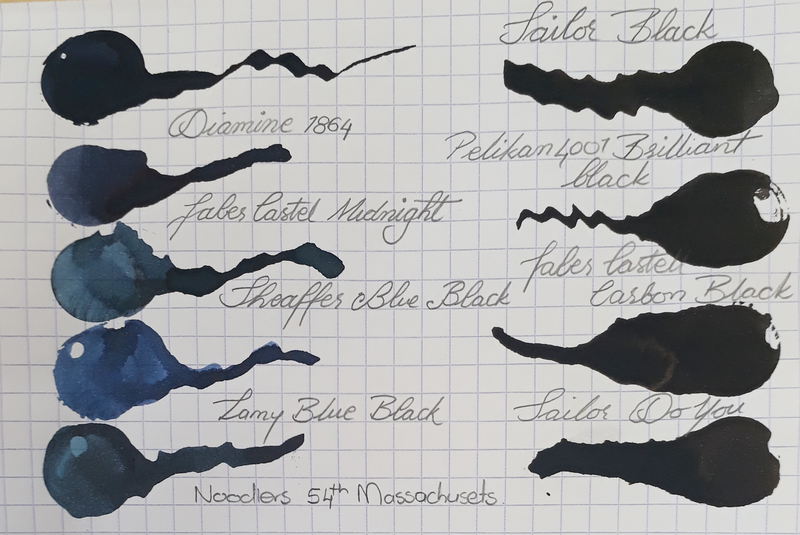 Water resistance is non-existent as expected, and the shading seems to show itself much better in the calligraphy letters, then in the actual shade swatch.